The Recipes example shows how to use Qt XML Patterns to query XML data loaded from a file. In this case, the XML data represents a cookbook, cookbook.xml, which contains <cookbook> as its document element, which in turn contains a sequence of <recipe> elements. This XML data is searched using queries stored in XQuery files (*.xq). The UI consists of three group boxes arranged vertically. 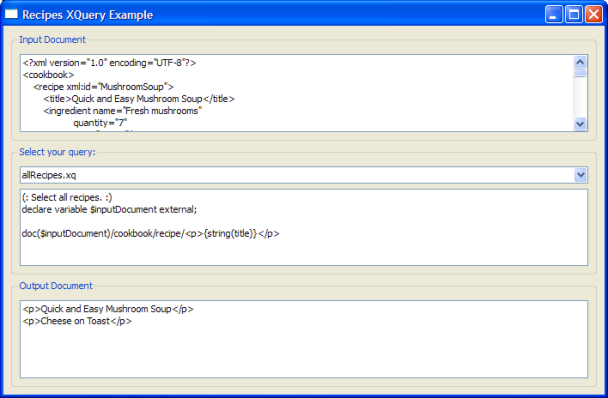 The top one contains a text viewer that displays the XML text from the cookbook file. The middle group box contains a combo box for choosing the XQuery to run and a text viewer for displaying the text of the selected XQuery. The .xq files in the file list above are shown in the combo box menu. Choosing an XQuery loads, parses, and runs the selected XQuery. The query result is shown in the bottom group box's text viewer. You can write your own XQuery files and run them in the example program. The file xmlpatterns/recipes/recipes.qrc is the resource file for this example. It is used in main.cpp (Q_INIT_RESOURCE(recipes);). It lists the XQuery files (.xq) that can be selected in the combobox. To add your own queries to the example's combobox, store your .xq files in the examples/xmlpatterns/recipes/files directory and add them to recipes.qrc as shown above. The constructor finds the window's combo box child widget and connects its currentIndexChanged() signal to the window's displayQuery() slot. It then calls loadInputFile() to load cookbook.xml and display its contents in the top group box's text viewer . Finally, it finds the XQuery files (.xq) and adds each one to the combo box menu. The work is done in the displayQuery() slot and the evaluate() function it calls. displayQuery() loads and displays the selected query file and passes the XQuery text to evaluate(). evaluate() demonstrates the standard Qt XML Patterns usage pattern. First, an instance of QXmlQuery is created (query). The query's bindVariable() function is then called to bind the cookbook.xml file to the XQuery variable inputDocument. After the variable is bound, setQuery() is called to pass the XQuery text to the query. Note: setQuery() must be called after bindVariable(). Passing the XQuery to setQuery() causes Qt XML Patterns to parse the XQuery. QXmlQuery::isValid() is called to ensure that the XQuery was correctly parsed. If the XQuery is valid, an instance of QXmlFormatter is created to format the query result as XML into a QBuffer. To evaluate the XQuery, an overload of evaluateTo() is called that takes a QAbstractXmlReceiver for its output (QXmlFormatter inherits QAbstractXmlReceiver). Finally, the formatted XML result is displayed in the UI's bottom text view. Note: If you add add your own query.xq files, you must declare the $inputDocument and use it as shown above.